Open your search bar by pressing the windows key. Win 10: Type “dxdiag” in the search bar and press <enter>. Save it as a text file on your desktop. Please create a zip archive that contains all folders (minus “webcache”) and email it to us to zyddie@bfgames.biz. In Fade To Silence, there are actually two ways to take a screenshot. in the game, press [ALT]+[F2] (or your custom key setting) to activate Nvidia’s Ansel screenshot tool. The screenshot will be saved in your default Ansel folder. There is a hint displaying when you take the screenshot. Attach the screenshot to an email. in the game, press [F12] to take a screenshot with Steam. In your Steam client, click on “view” in the navigation, and select “screenshots” in the drop down menu. A new window will open. Select show “Fade To Silence” in the drop down menu. Click “Show on disk” to open the file folder on your PC. 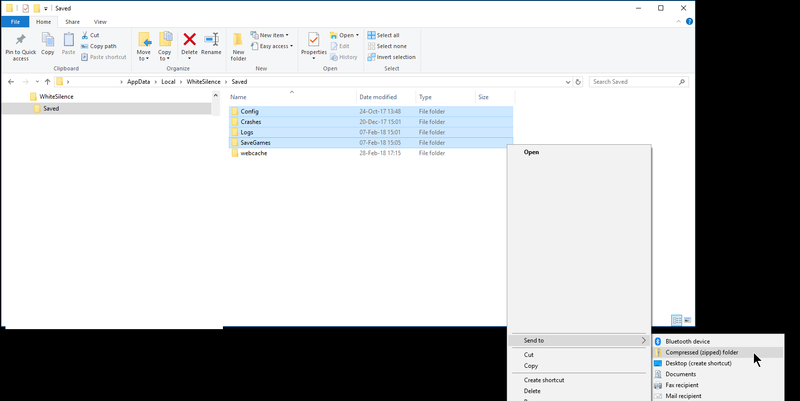 A new zipped file with the same name as the parent folder is created in the same location. To rename it, press and hold (or right-click) the folder, select Rename, and then type the new name. Please send us this file! Please remember: When you send an email, please include a detailed description of what happened and what you did before the crash, how long you played, if you JUST started a new game or continued a save game. The more information you give us to work with, the quicker we can resolve it and publish a patch. Does your PC support the minimum specs recommended for Fade To Silence? Please check at the end of this article. Do you use a dedicated graphics card? If you use a Laptop, the chances are that your display adapter is an integrated chip Intel HD-400 or similar. Please note that Fade To Silence requires a dedicated graphics adapter to run properly. If you don’t have one installed, then Fade To Silence WILL NOT work. Are your display drivers up-to-date? If not, then please download the latest drivers from your graphics card’s manufacturer and install them. Please also check if your other device drivers are up-to-date. Check your game setting. Please do not run the game with high settings if your hardware is below the recommended specs. The image on my screen is overlaid with green lines. change to “UseNvidiaColorSettings” and leave the standard settings in place. This approach should fix the green lines. There is a bug with the VR on our side. We will fix it when we can. Right now we focus on performance issues to offer a stable game experience. For the moment, please unplug your VR headset as a temporary workaround. We need as much information as you can give us. Please provide a step-by-step instruction that leads to the bug. It makes it easier for us to recreate the bug. Can it be reproduced? Means: When you repeat your action or are in the same situation, does that bug occur again? Provide your save game and as many info from your save game folder as possible (See above for instructions to create this file). Send screenshots – if you are exploring, take a screenshot from your map. Mark the area where the bug happened and also take a screenshot, if possible. Help I'm stuck in the world / Something is not working properly. Please let us know and provide as much information as you can give us. Send screenshots – if you are exploring, take a screenshot from your map. Mark the area where the bug happened and also a screenshot. Why is the game performing so slow? Why are there so many FPS drops? I hate the six lives system. We think that a finite amount of lives makes you value your character more and therefore lets you take a more careful approach to the game. If we forewent any consequences of dying, a character’s life wouldn’t be worth much. Currently, the six lives system is not fully implemented. We have plans to adapt it and even add systems that will soften the impact when you must start over. The faces and animations seem broken, what can I do? Set the view distance option to “High” or “Ultra”. This should fix the facial animations in the cutscenes.